”Wow”. “Stunning”. “Amazing”. These are words we often hear when customers see Symposium’s Renaissance - inspired restaurant interiors for the first time. The Renaissance was a time of enlightenment, so what better way to stimulate the discussions that take place within our unique stone art walls than to surround our guests with some inspiration?. And it’s not just restaurant guests who are attracted to our beautiful surroundings; we’ve also got professors regularly sending students to examine the works as part of their curriculum! The quality of workmanship in our stone art walls and modern frescos is just another way we invite you to escape the ordinary. Each one of our restaurants offers guests a similar decor, yet one that is customized in size, seating and design, to give it a one-of-a-kind feel. You won't find a restaurant like it. 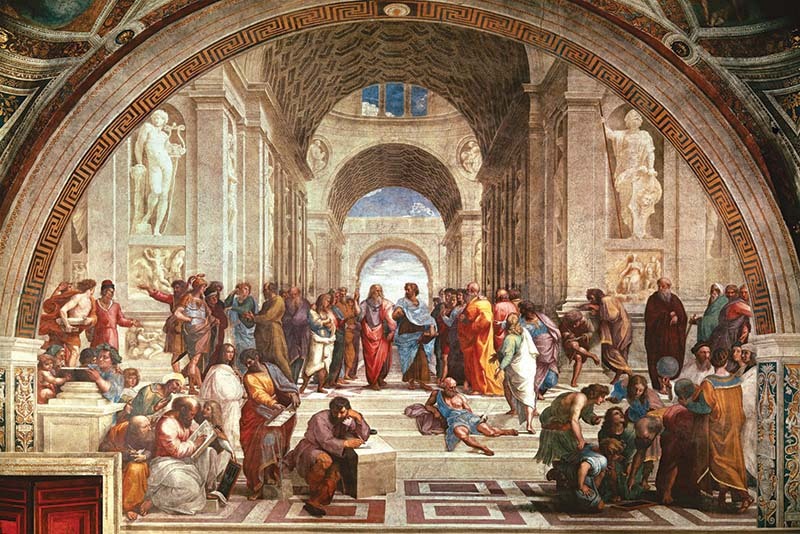 Raphael’s famous "School of Athens" fresco is our trademark visual centerpiece in each restaurant. 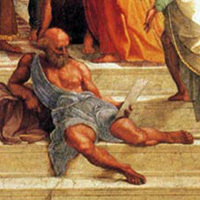 This classic work shows philosophers Aristotle and Plato debating their viewpoints while all around them other scholars are engaged in conversation, work, or games. We like to think of Symposium as the modern-day version of this gathering: a business meeting at one table, a family celebration at another, a romantic meal on the patio, and a solo diner enjoying downtime. Business or casual. Formal or relaxed. We’ve got a place for everyone and a menu for every taste. 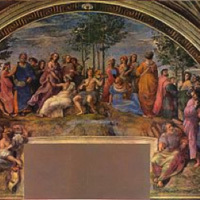 Raphael, 1510-1511, Fresco, 8m x 5.5m. 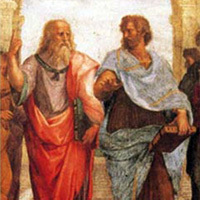 Plato and Aristotle, the two great philosophers of the classical world are central to this piece. 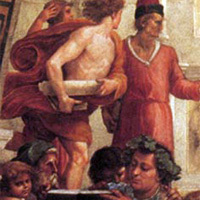 King of Macedonia and a pupil of Aristotle, Alexander is seen here listening attentively to Socrates. 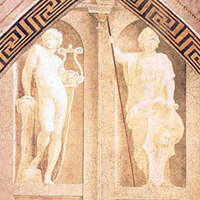 Raphael included these two figures to emphasize the schools of thought represented by Aristotle and Plato. 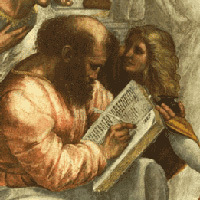 The renowned mathematician, Pythagoras, embodies arithmetic and music. Reflecting two schools of thought, these philosophers share a world of provocative and debatable theories. The cynic Diogenes, hated worldly possessions and lived in a barrel. His attitude is reflected in his clothing and posture. This was Raphaels creative way of connecting the past and present, and of paying tribute to the great men of his day. This philosopher taught that happiness lay in the pursuit of pleasures of the mind. 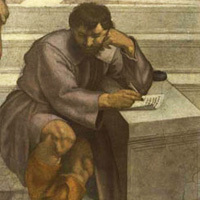 This lonely character, who was not in Raphael s preliminary drawings, represents the melancholy philosopher, Heraclitus, who it was said wept for human folly. The painting shows the mythological Mount Parnassus where Apollo resides. 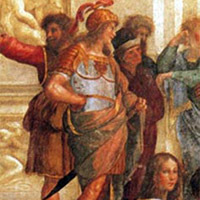 He is surrounded by the nine muses, nine poets from antiquity, and nine contemporary poets. Also known as "Allegory of Spring". 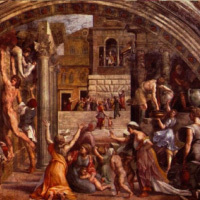 The history of the painting is not certainly known, though it seems to have been commissioned by one of the Medici family. 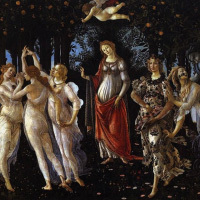 It contains elements of Ovid and Lucretius and may have been inspired by a poem by Poliziano. 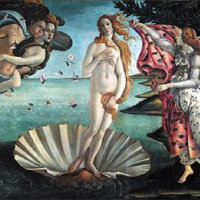 It depicts the goddess Venus, having emerged from the sea as a full grown woman, arriving at the sea-shore. 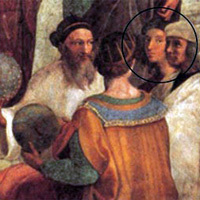 The painting is held in the Uffizi Gallery in Florence. The Fire in the Borgo shows an event that is documented in the Liber Pontificalis: a fire that broke out in the Borgo in Rome in 847 CE. According to legend, Pope Leo IV contained the fire with his benediction.